Jeff Iorg reminded messengers that his past several reports have dealt with transition, moving the campus and a name change. "That is behind us now," Iorg said. 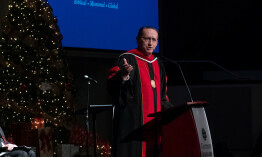 "I am pleased that today my report is about Gateway Seminary at its best." 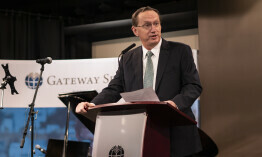 Jeff Iorg, president of Gateway Seminary, reminded messengers that his past several reports have dealt with transition, moving the campus and a name change. "That is behind us now," Iorg said. "I am pleased that today my report is about Gateway Seminary at its best." Iorg reported that Gateway students and faculty recently traveled to a remote Southeast Asia country in cooperation with the International Mission Board to ask two questions of those in that area: Does anyone here know the man named Jesus and does anyone here know someone who is a Christian? "In one area, the answers to both questions were 'no,' so they checked into a local motel. The next morning, one of the students was outside singing, and the woman who ran the hotel came to her and asked if she was singing folk music. The student said no, she was singing a song to praise God. The woman accepted Jesus Christ as her Lord and Savior, the first person in that region to do so." Gateway students studying in both online and traditional formats have shared the Gospel 429 times in shelters, on the streets, in malls, to friends and to people they have never met during the past year, Iorg reported. "Ninety-eight people prayed with our students to receive Christ as Lord," he said. "One student was so inspired that he expanded efforts to the children in his church. In all, more than 100 people came to Christ through evangelistic training in our classes. These stories show Gateway Seminary at its best." Iorg said faculty and staff, in moving to Southern California with the seminary's transition in 2016, bought houses in neighborhoods with no churches at all. "Some of these people pooled their resources to start churches instead of driving a distance to find a church. Gateway Seminary is taking the Gospel to places it has never been heard, expanded the Gospel and started churches." Despite the relocation, Gateway's enrollment has remained steady at about 2,000, Iorg said. The seminary has graduated 600 students in the past two years [since relocating] and received two special donor gifts. "No one on Gateway Seminary's staff requested these gifts," he said. "Instead friends of the seminary asked friends to give. Those two gifts totaled more than $1 million." Iorg also told messengers that the seminary has offered classes since 1962 on the Southern California campus located in Brea, Calif., but with the main campus in Ontario, Calif., the campus in Brea was no longer needed. The sale of that property will allow the seminary's endowment to increase from $16 million to $60 million. "We are the leading institution modeling multicultural ministry," he said. "For two decades, Anglos have been in the minority on our campus. Sixty percent come from the countries of the world, and more than 30 percent of our students are women." Iorg answered questions from messengers about how Gateway was navigating the balance between online and traditional education, what steps were being taken to equip the faculty to better handle physical abuse cases and what the seminary was doing in restitution of the cases involved. "We keep meticulous records gauging progress between online and traditional classes," he said. "Our online classes are not simply glorified correspondence courses but educational experiences similar to those in the traditional classroom. We find that there is little difference between the two." In his 14 years as Gateway president, Iorg said, a serious allegation of abuse has never been made among students, faculty or staff. "We do have clear policies in place at Gateway. In California, we are mandated to do sexual harassment training, and we follow that mandate as well." 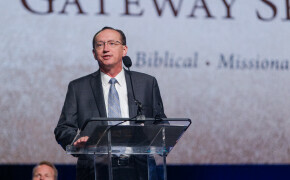 Iorg thanked Southern Baptists for its support of Gateway Seminary and asked for prayer. "Thank you for your gifts and for sending us your students. I appeal to you today to put Gateway on your frequent prayer list. In California and in the West, we face constant pressure every day for our stance on biblical marriage and other issues."